Wake up around midnight and it is raining. You soaked red lentils in a pot since before the morning. Put the pot on a burner set to high heat. In another pot pour oil then it goes on the burner set to medium heat. Each will need 45 minutes. Pour wine and pull a yellow onion from a basket. Papery flakes fall on the floor. You leave them there. Chop and drink and let tears clean your face. Drop in the cumin seeds. They sizzle and dance. Onions, more cumin, lemon, tomato, red powder, yellow powder, salt and honey get spooned into the hiss. I’m impressed with the work I’m seeing in Best American Experimental Writing 2018 (Middletown CT: Wesleyan University Press, 2018), guest edited by Myung Mi Kim, having already filled columns of notebook space with the names of writers I clearly need to read more work by, including Rosa Alcalá, José Felipe Alvergue, Stine An, Genève/Geneva Chao, Julia Drescher, Biswamit Dwibedy, Jill Magi, Nicole McCarthy, Saretta Morgan, Soham Patel, MG Roberts, Asiya Wadud, Alli Warren and Uljana Wolf. And that, I might add, is barely a quarter of the contributors to this hefty anthology. Thrilled also, obviously, to see work included by Erín Moure, Kate Sutherland, Norma Cole, Stephen Collis and Layli Long Soldier (her book is so good; see my review of such here). I should begin with adik, with reindeer and caribou. To know the geography of it, to start with its features. Agawaatse is not sound but shadow. An interception of light. 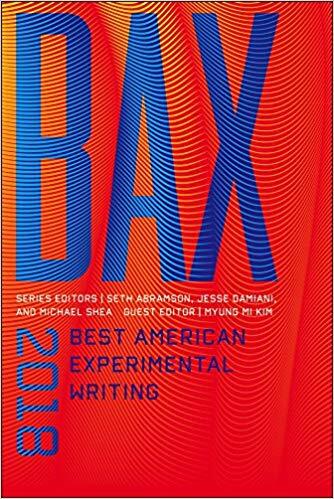 Best American Experimental Writing 2018 is the fourth in the series of annual volumes opening with Best American Experimental Writing 2014, a series edited and overseen by Seth Abramson and Jesse Damiani. I find it interesting to see this series in counterpoint to the Best American Poetry series, obviously, but also the Best Canadian Poetry in English series, one I’ve long been complaining about as leaning far too heavily (and nearly exclusively) into the territory of the metaphor-driven lyric, something that has actually shifted a bit, given more recent guest editor Hoa Nguyen. The American equivalent, Best American Poetry, has been more open to more experimental works, so the response of a series such as Best American Experimental Writing suggests that the country as a whole is more open to experimental writing than we are in the north (or perhaps there are simply a series of market-driven considerations I don’t really comprehend that are driving elements of the conversation on either side of the border; who knows). For her part, it’s good to see this note from editor Kim as part of her introduction, writing that: “As with former guest editors of BAX, I chose not to include colleagues past and present, current or recent students, writers who were published in previous editions of BAX, and past editors of BAX. This means that many, many exceptional writers are not part of this volume. I made every effort to gesture towards small magazines and other publishing projects that may be less visible in the larger fabric of the discourse around experimental writing. One of my priorities in gathering material for BAX 2018 was to feature emerging writers. At the same time, recent work from some established writers made it possible to acknowledge/reframe stakes and commitments of experimental writing practices.” This is interesting in a few ways, including the fact that Kim, as well as prior editors, aren’t including work by writers who have already appeared in the series, allowing for a far more open field of contributors, one that works very deliberately to utilize the series as one of introduction, which I am very much appreciating.